List Rules Vote up the origami that reeks of the Force. A combination of a global phenomenon and a timeless art form, Star Wars origami tells the story of a galaxy far, far away on a completely new set of pages. As hi-tech as the Star Wars franchise gets in terms of robotics and weaponry, people managed to find a way to translate that futuristic vibe into some cool Star Wars origami. Star Wars fan art arrives from all corners of the Internet in a variety of ways, and origami Star Wars figures simply show another take on this seemingly endless story. Origami inspired by Star Wars, like Star Wars versions of famous albums, combines two different classics, in this case origami and the films, to create something entirely fresh. 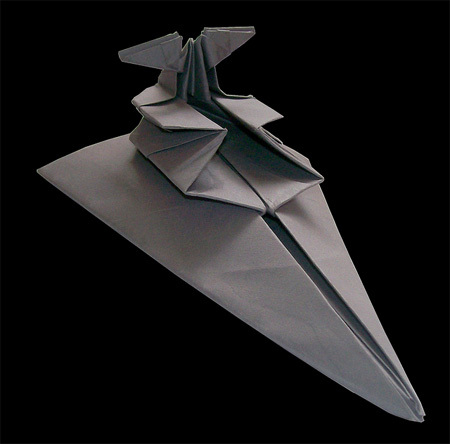 An origami X-Wing might sound like a joke, but it's hardly the funniest Star Wars art out there. If anything, these origami Vaders and lightsabers look ready to take part in the never ending fight for galactic control. The paper figures below look geared up and ready for an adventure, and if you study up on some of the artists' origami techniques, even you might be able to join them one day. Complete with tiny little fingers, this delicate origami model of Master Yoda came from the hands of deviantetienne. Impressive, it is. A great miniature Millennium Falcon by Tadashi Mori that looks ready to withstand some asteroids. Jeff Lee's Star Destroyer looks like it is ready to battle the rebellion. This awesome looking X-Wing fighter by Mike1014805 just needs a paint job before it can battle the Empire.